Marvel’s Agents of SHIELD continues to build the world of the dystopian future as the characters navigate their new surroundings in different ways. The previous episode ramped up the tension with Daisy’s capture and the rest of the team being on generally shaky footing after almost being sold out by Zev so there are constant reminders of how unsafe the current situation is and that the characters have to be ready for anything at all times. This episode moves forward the disparate character stories and takes steps to begin bringing them together. Daisy being captured brings her closer to Simmons while the rest of the team have finding their people on their mind as well as answering the call from the surface of Earth. Daisy’s capture gives her the opportunity to interact with other Inhumans and learn what the future is like for them. Her window into this is the psychic warrior Ben (Myko Oliver); he’s very much a textbook example of someone who has to live in this dark future and has found a way to make it work for him. In that respect he’s very similar to Deke but the main difference between them is that Deke enjoys relative freedom where Ben lives a more restricted life. That’s the difference between being Inhuman and Human in this world. Both are enslaved but Humans are used as labourers and seem able to come and go as they please when they aren’t doing the required work where Inhumans are under very close scrutiny and under the boot heel of Kasius who looks to sell them based on their skills in an arena. It’s self evident that enslaving people and forcing them to fight for the purposes of entertainment is a bad thing. 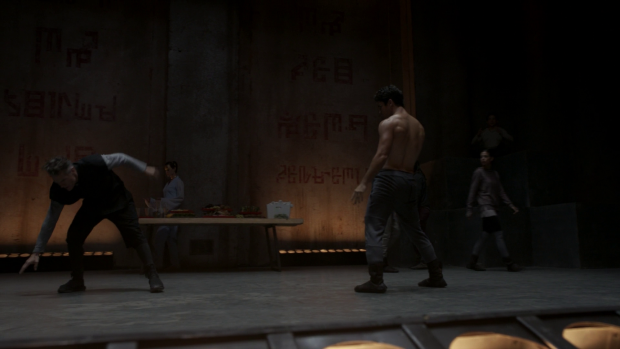 The “Fight Club” concept is something that shows like this eventually get around to because it’s an easy and organic way to provide super powered fights while exploring a criminal underground or slave trade. Either way it’s a bad thing and lets the people with powers fight each other so it’s an easy excuse to show off the abilities of various characters. As I pointed out this show is going down the slavery approach which provides some interesting perspectives on the roll of Inhumans in this particular society. Daisy is new to it so is full of enthusiasm about escaping which provides a clear contrast to Ben’s attitude of making sure that he survives. He does this by besting others in combat and staying under the radar enough so that not a lot of attention is paid to him. His ability to read minds is useful to Kasius as well so that keeps him in a position of mild influence. The morality of telepathy is touched on somewhat when Daisy points out that it’s rude to read minds without permission but Ben points out that he actually has very little control over what he hears but clearly has no moral objection to using what he learns for his own ends. This mostly manifests in the arena where he is able to anticipate the moves of his opponents and plan a counter before they’re even made. It’s a creative use of his power and the matter of fact way it’s explained shows how well integrated Ben’s power is with the rest of his life. His ability is used in another clever way in this episode. Daisy and Simmons are asked the same question about how they wound up in the future with the notable handicap of Simmons being unable to hear Daisy’s answer. Kasius does this to check that their stories match so that he can get to the truth about whether others from the past have been brought forward in time. Thanks to Ben’s ability to allow others to hear what he is thinking Simmons is able to replicate Daisy’s story and Kasius is briefly in the dark about the existence of the others. I liked this as a way to develop Ben as a character and his ability though I would have preferred this as a showing of how well Daisy and Simmons work as a team. Daisy’s story has a lot of the truth in it up until the account of what happened in the Diner. The narrative is changed to Daisy and Simmons being alone in the Diner rather than the rest of the team. If Simmons had reached the same conclusion without communicating with Daisy it would have shown how well they know one another and how effectively they work together. Having the account of the events be mostly true certainly points in that direction as it has been previously established that the best cover stories have an element of truth to them. Using Ben to make the stories match wasn’t a bad choice but it was a missed opportunity to use Daisy and Simmons’ friendship in a really clever way. As this is going on the possibility of an Inhuman resistance led by Daisy comes up. The fact that Daisy enjoys Legend status as “Quake: destroyer of worlds” gives her a lot of leverage with her fellow Inhumans as well as the rest of the Kree. Even though she is a prisoner she is kept at arms length because of what history records her as being capable of. This is something that she intends to use and the seeds of rebellion are sown. Of course this is a time sensitive problem since Kasius has invited guests to bid on her as a slave. The surprise appearance of Fitz does bring hope to this scenario. It was a well played surprise in an already tense scene and his mention of putting Daisy in a fight to the death does have some shock value attached to it. 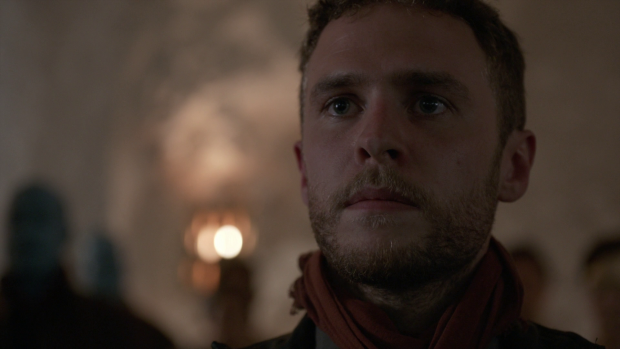 The earlier mention of Fitz being responsible for the death of Mace was brought up to remind the audience that the character might still be on a dark path which adds uncertainty to his appearance at the end of the episode. My thinking is that this is very much a red herring and it will all be part of Fitz’s plan though that will likely be cleared up next week. 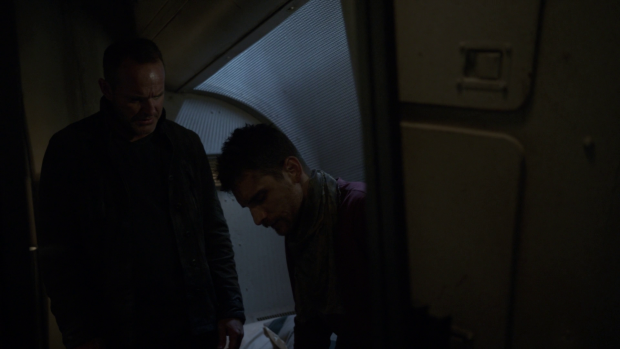 Elsewhere Coulson and May are working on finding a way to the surface so that they can answer the signal discovered last week. 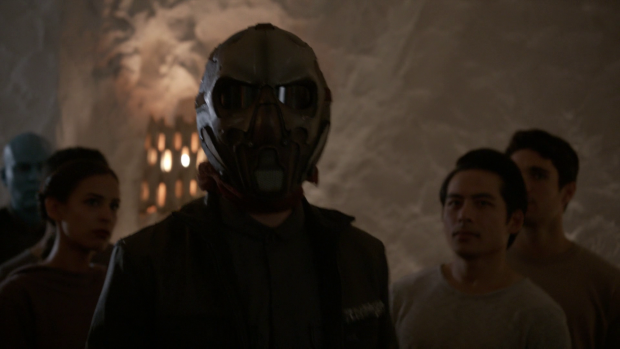 To do this they enlist Deke who is the best approximation of an ally that they have in their current circumstances. He proves useful in helping them navigate the Lighthouse and reach the secretive Level 35 to investigate what unknown things go on there. Deke’s involvement allows him to become part of the cast in a way that feels unique to him. The back and forth on whether he can be trusted or not keeps him interesting and his dynamic with the other characters is always watchable. It’s notable that he behaves slightly differently around different people while still giving a sense of his baseline personality. When around Coulson and May he seems almost afraid and tries to only talk when there’s pertinent information probably because he feels like he might be found out. The way he talks about what happened to Daisy is a good example of this as he mentions that he saw her recently but doesn’t go into a lot of detail. 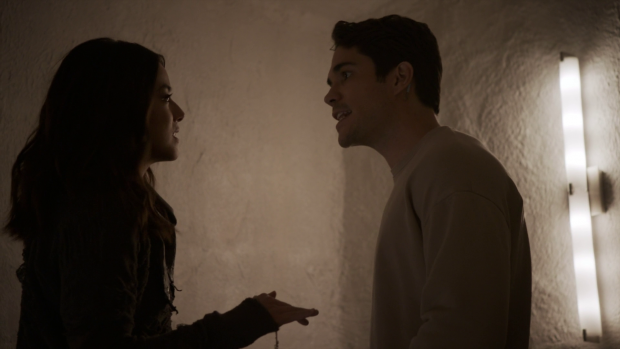 This is consistent with Deke’s character as established so far; he is clearly capable of managing people and situations so that they work out in the best way for him. Further insight into his past and how he fits into this world is given through the way he talks about the role of children in this society. It is revealed that children aren’t born in the natural way because the Kree think it’s more efficient to engineer children rather than wait for them to be born the old fashioned way. Newborns are a commodity to be traded and sold so that people can have the experience of parenthood. Kasius decided on this course of action because his way increases the likelihood that children will eventually be compatible with Terrigenesis therefore providing an increased stock of Inhuman slaves to be used and sold off as necessary. It’s all horribly dehumanising which is nothing new in this arc but the use of innocent children as a resource makes the situation more horrifying. Deke happens to be one of the last Humans born the old fashioned way and the implication is that he is entirely Human with no potential to become Inhuman which means that he is largely left alone. Being unimportant has helped keep Deke alive and allows him to comment on the state of society because he is able to navigate it in ways that others can’t. 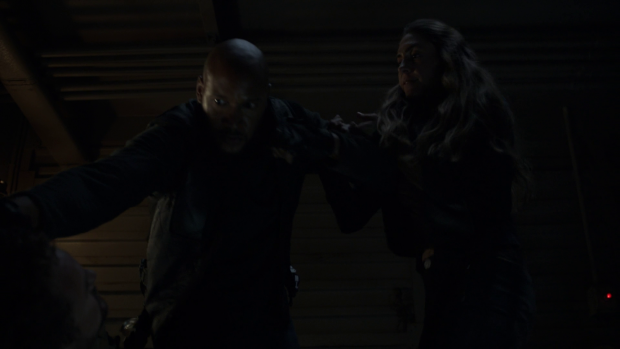 These scenes also allow Coulson and May to find out about Daisy’s capture and shakes their faith in Deke once it becomes clear that he lied to them. They don’t accept his explanation of his actions being necessary though they can understand the position he was in. As far as Coulson’s concerned he can’t be trusted and is sealed inside a room while Coulson and May continue on. I’m unclear on why Deke lied to Coulson and May about what happened to Daisy as he didn’t stand to gain anything from it especially after learning that his father is the source of the transmission from Earth’s surface. Making himself look untrustworthy is surely counter to his best interests at that point. The reveal of how Human children are created ties into Mack’s role in the story as he is sent by Grill to rough up Gunner (James Harvey Ward) because he owes Grill money. Grill’s entire reason for doing this is because Mack is a big guy so it makes sense to put that muscle to good use. Elena tags along and compares their current surroundings to where she grew up which makes for a really interesting observation as it explores the idea that for some people the future doesn’t really get any better and past mistakes are often repeated because nobody learns from them. Fair enough the destruction of Earth and being slaves to the Kree is far from ideal but the fact that people fall on old habits in order to survive is a fascinating idea and Elena’s background definitely counts as unique insight into this mindset. It all adds up to misjudging Gunner in a really profound way. All they know is that he is waiting for a package from level 35 that he has apparently paid a lot of money for which is considered unacceptable considering he still has debts to pay. Mack takes a very black and white approach to handling this mostly because he has to. He’s uncomfortable with roughing people up to get them to pay their debts so the only way to stomach is is to proceed on the assumption that it’s somehow the right thing to do. Mack is clearly concerned about compromising his principles but Elena is there to offer support and assure him that they don’t have to lose who they are in order to survive this world. She has experience with scaring people without hurting them and is positive that the same skills can be applied here. This is very quickly turned on its head when he learns that Gunner is waiting on a child being sent down to him so that he can be a parent. Naturally this strikes a very personal nerve for Mack who is still torn up after the loss of his virtual daughter. Gunner brutally tears him down for threatening a child -even if he didn’t know that was happening- and causes him to revisit the feelings of loss he has been pushing aside. Mack is is really angry with himself for being depressed over the loss of a virtual child when he was able to process the loss of a real one. This adds layers to Mack’s pain because it’s clear that he didn’t ever truly deal with the loss of his real child. The loss of Hope inside the Framework reopened that wound in a really potent way and brought back all of the feelings that he thought he had dealt with. Elena’s presence provides important context for Mack when she tells him that it’s acceptable to grieve whether his recent loss was a virtual one or not. She tells him that being so affected by the loss of virtual Hope is proof that he’s a good man. Scenes like this prove why Elena and Mack’s relationship is so worthwhile and this represents an important step forward for Mac who can now begin to process his experience. As good as this episode was when it comes to the handling of the characters and world building there isn’t really an awful lot of plot movement. 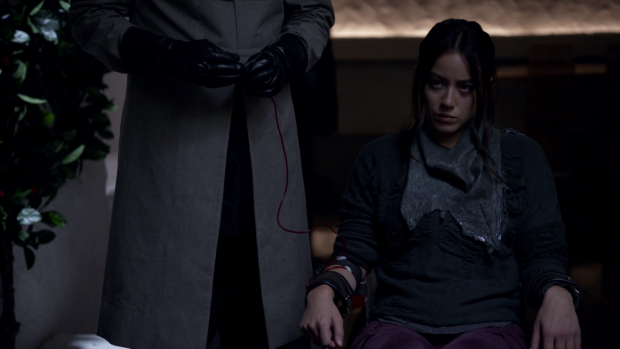 Taking the time to flesh out the world around the characters is definitely a good thing but there’s a sense of stagnation to some of this episode particularly where Coulson and May are concerned simply because there has been no real forward momentum on reaching the source of the transmission, It also feels like stalling to a certain degree. I really enjoyed May’s fight with Sinara (Florence Faivre) but it does little more than create an excuse for a further delay caused by May’s presumed capture. Another excellent outing that builds the world around the characters in fascinating ways. Introducing Daisy to the Inhuman Fight Club scenario allows her to process the way Inhumans are treated as well as build on what other Inhumans are forced to do in order to survive by using Ben as a case study. He’s also an interesting character in his own right and his abilities are used really well here. Having him help Simmons and Daisy match up their stories to keep suspicion away from the rest of the team was a good choice though I would prefer if the stories matching was a way of showing how deep the friendship between Simmons and Daisy is. The Fitz reveal as part of this was intriguing though his desire to see Daisy fight to the death is most likely a red herring. Fleshing out Deke’s backstory through the reveal that babies are a commodity in this dark future and establishing that he was one of the last natural births works really well. Deke teaming up with Coulson and May before his lies were discovered helps reinforce the fact that Deke is a survivor able to adapt to different circumstances and alter himself slightly depending on who he is interacting with. Connecting this to Mack’s story and forcing him to deal with the recent loss of his virtual daughter was a really neat connection that adds layers to Mack’s grief. Despite this episode being really good at world building and character development there’s a hint of stagnation as May finds herself presumably captured and there is no forward movement on finding the source of the transmission.